Plans for this year's May Day celebrations are well underway and more details will be posted here as arrangements are confirmed. 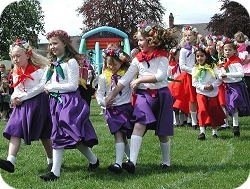 We are seeking dancers for the Maypole - no dancing experience required, this is just for fun. If you cannot dance, the why not join the parade? Children and adults welcome. Wear fancy dress if you like. 3.30pm - New Quorn Shakespeare Company Medley of songs from their “Don’t Dilly Dally” show being performed at the Village Hall May 20th and 21st and also May 26th, 27th and 28th. See the village calendar for more information. 4.00pm - Dog Show Awards. download Word version / PDF version. Please contact the organisers if you wish to take part in the Parade. If you wish to book a stall, please complete and return our booking form asap. Download the form in Word or PDF. Download our May Day Poster and put it up in your window, school noticeboard or car. Download here or click on the swatch. Details about the Dog Show will be available soon.